Go Visit This Restaurant. Select "Want Name/Address" and take a drive out! RENT IS ONLY $2,200 PER MONTH! THAT'S WORTH MORE THAN THE PRICE ALONE! This beautiful restaurant facility is a great steal not only because the rent is so low at $2,200 a month, and not because the neighborhood has limited restaurant spaces available, and not because the current volume in 2017 was $265,000 for a 5 day a week dinner business where there is certainly an opportunity to expand to 7 days as well as add lunch in the winter months, and not because it is located in a high-end neighborhood of North Scottsdale; rather because the rent savings alone worth more than the asking price. How do I figure you may ask. Simple math. The business owner is the landlord and he's more interested in finding a solid tenant than running a restaurant. The lease rates in the area are least twice as much. That's a monthly savings of at least $2,200. A location in this area leases for $36-$45 Sq. Ft. This space is a bit more than $1 SF, saving one no less than $26,400 a year. This translates into a rent savings of more than $143,000 over 20 years. Oh and did I mentioned the restaurant is gorgeous and recently had the entire dining area renovated with high ceilings and crafted AC ducts? Let's sweeten the pie here. The landlord will consider giving two months of free rent to help you get your new concept off to the races for the right buyer! This restaurant seat 60, with a 750 Sq. Ft. patio on the east side of the building where there is shade in the afternoon. The kitchen has a well thought-out design, making cooking simple and efficient. You need to come see it. 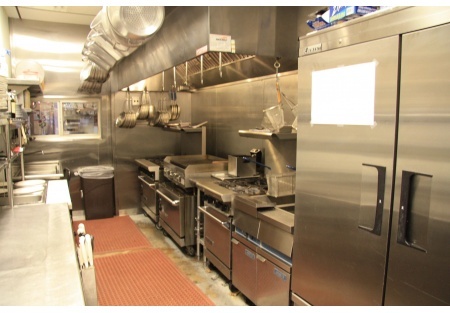 There is a walk-in cooler, large hood system and plenty of prep areas, with 10 stove burners, 3 ovens, one 3 ft. grill, one counter-top electric fryer with 1/2" gas line available for a large deep-fryer and a deep fryers, gas pasta cooker with water spout boils water in 5 minutes.